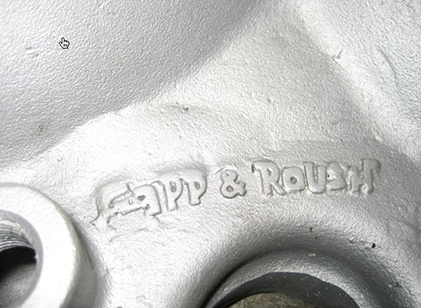 Had a question come in that asked where the 302 Manifold that was cast with ‘Gapp and Roush’ on it. There is no direct answer. One of the after market suppliers made a single plane manifold for 351 Ford and 350 Chevy, probably Edelbrock, probably for NASCAR. IHRA created the mini.prostock class for small block and four barrel carb. Since the 302 Ford had a shorter block, the 351 manifold did not fit the 302. We cut a portion of the flange off and made a narrower manifold for the Shindig car. When others wanted one Roush took a sample to a pattern maker and ordered patterns to duplicate more. I don’t remember what name he put on them as this was about the time of the split. I think the first were Gapp & Roush and subsequently Roush.